Disability Awareness Series Part 3 I bet your never thought of this? I hope so far in this disability awareness series I have given you more of an insight into what it's really like to be a disabled dog owner. I want to share with you a few problems that I soon faced that altered the dynamics of owning Lottie due to my disability. I know I have let you guys know about this before but all my childhood life all I wanted was a dog. Due to long hospital stays this simply wasn't possible. However on my 18th birthday I told my mum I had saved the money for a Westie puppy and had booked an appointment for a viewing that afternoon. Having an accessible bungalow you sometimes forget all others are not so wheelchair friendly! Once she knew about the appointment she agreed that we could go to have a look but didn't promise anything. I already had the address but stupidly had glanced over the fact that in the address it stated it was a farm! A farm and a wheelchair hardly go together well. Unfortunately I didn't realise this until we got their, however I was that determined to see Lottie's mum who was pregnant at that point. We all teamed together and I did get to see Lottie's mum and I'm pretty sure you're all aware of the result of our first visit. This is my 18th Birthday. Lottie is just 8 weeks old! This is just one of the first small things that altered dog ownership for me, normally the first meeting would be something many of you don't even give a second thought to. For us this was certainly not the case! 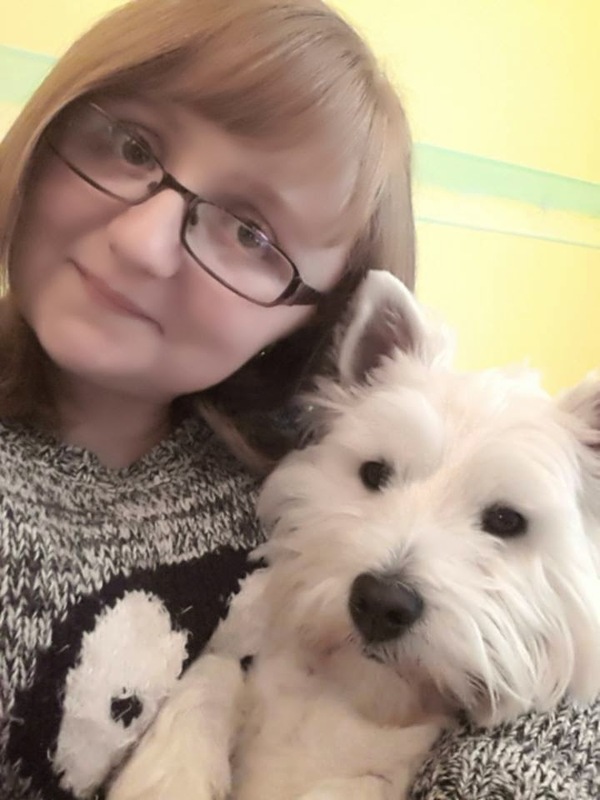 I remember a very important statement that my Grandma made before we even collected Lottie, "Dogs normally attach to one family member more than others, its normally the person who feeds the dog". In our household dog ownership would involve two people. Me and Mum, after the statement my grandma had made panic struck, what about when I was poorly from a fracture, or I was recovering from surgery. Would the dog I had brought to bring so much joy to MY life, be attached to my mum instead. As far as feeding we were using a baby gate when we first brought Lottie home, one I couldn't get my wheelchair over so yet another small obstacle that meant I couldn't 'bond' with Lottie. 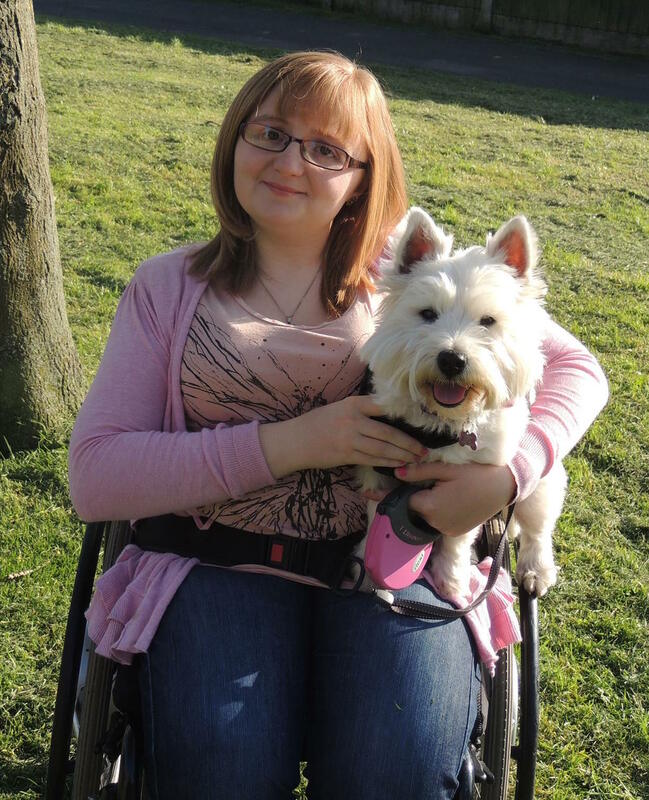 It a strange thing to say but I feel that being in a wheelchair actually brought me and Lottie closer together, because each small little issue we faced took so much hard work, there was no way the two of us could not be bonded. Needless to say we the best of friends and actually Lottie responses more to me than my mum. (Don't let her know I told you guys that). We clearly have no bonding issues now! Dog walking is something so many dog owners take for granted. I have been in a wheelchair all my life so am extremely used to managing to push with one hand (and not go around in circles!) when carrying shopping etc. So walking Lottie would be easy right! Wrong, this was more of the reality I faced. I had a very excitable little puppy on the end of the leash. I was trying to juggle holding the clicker in one hand (I was teaching walking to heal), the lead in another, managing treats. and making sure most importantly I was training Lottie correctly and push my wheelchair. I know us women are the masters of multitasking but this was pushing that fact to the limit! I had many walks with Lottie where I thought we would never get their and walks on our own were definitely off the cards for a while! I was however determined this wasn't going to stop us and persisted and I got involved in as many of Lottie's walks as possible. About 6 months later Lottie was beginning to calm down and also the clicker training was well embedded. One day I just decided "OK today I'm going to take Lottie for a short walk on my own". We only went around our cu-de-sac but it was one of the best decisions I ever made. On our own we learnt to work together and found ways to adapt our walks, we gradually built up the distance which is where I actually started to enjoy walks with Lottie instead of the dread and fear I felt before. We overcome this obstacle and now our walks are exactly the same as yours! This may look easy, but it took months of hard work! These are just two of the small problems I faced once Lottie came home. I will share a few more in the next part of this series. I really want to stress that the aim of this series is not for you to feel sorry for me due to these issues. It's about raising awareness of how a disability can impact so much on a persons life not only in terms of health issues but simple tasks such as bonding with your new puppy and the simple task of dog walking are such a big milestone. If you guys missed part 1 and 2 of my Disability Awareness Series the link to those posts are below. Be sure to give them a read too! 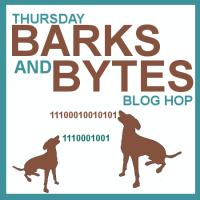 Part 1 - Disability Awareness Series Part 1 | Thursdays Barks and Btyes | Such a precious game of fetch. Part 2 - Disability Awareness Series Part 2 | Thank you Mum, three little words that mean so much! - National Carer's Week 9-15th June, are you aware? I found it difficult enough learning to juggle everything on those first walks, WITHOUT having to contend with a wheelchair as well! Good job - she looks like she walks much more to heel than my Lottie, who has a tendency to pull like a train when she wants to get somewhere like the meadows!